Why Grilled Pineapple & Brown Sugar Ham? That question can only be answered when you taste this amazing pairing of fruit and sweet brown sugar glazed meat. Ham is a popular choice for holiday meals like Thanksgiving and Christmas, but this recipe is so easy it can even be done on a week night. This grilled ham recipe only takes about 45 minutes including both prep and cooking time because you are starting out with an already fully cooked ham. Mix your brown sugar and spicy mustard together to form a rub or glaze paste. Rub this mixture together all over the outside of the ham. Place your brown sugar and mustard glazed ham on your heavy-duty aluminum foil pan. 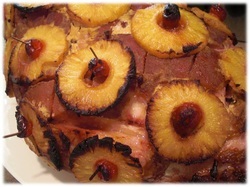 Arrange your sliced pineapples all around the outside of the ham. Poke tooth picks through the cherries and stick them through the pineapple to secure the pineapple slices in place. Pour a little bit of the pineapple juice in the bottom of the foil pan. This pineapple juice will cook out and help steam the ham to add moisture during the cooking process. Place your ham in the foil pan directly on your grill and close the lid on your grill. It is important to close the lid on your grill because you will be cooking the ham inside the foil pan, which will shield the ham from the flame. The residual heat when closing the lid will help surround the ham with heat and smoke. Your pineapple and brown sugar ham will take approximately 35 minutes to cook on the grill. This ham recipe starts off with a fully cooked ham, so placing it on the grill is just needed to heat it up and allow the pineapple and brown sugar to flavor the meat. Therefore, you should not be concerned with the inside temperature or making sure it is done before pulling it off. And, you will only need to put the ham on the grill for about 35 minutes to achieve a sweet and smokey flavor.